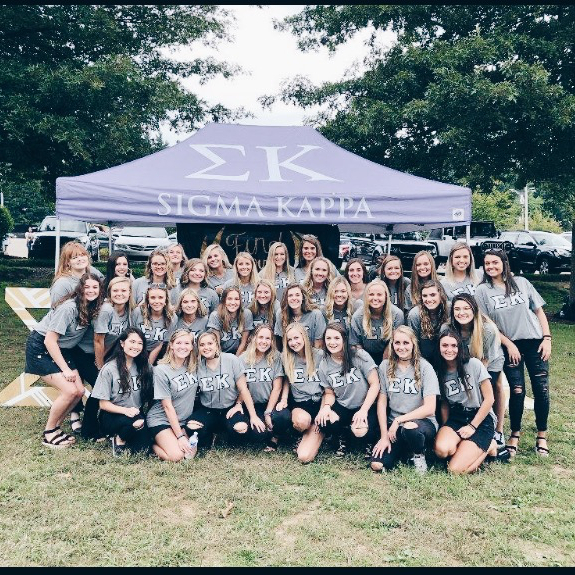 In addition to the tireless efforts we put into Sigma Kappa's five national philanthropies, we also make a point to support sisters with any philanthropic services they are passionate about. This includes, but is not limited to; annual school supplies drive, can drives and funding philanthropic indicatives for local families and alumni. We also participate in Appalachian State’s annual homecoming blood drive, MLK Day Challenge, Dance Marathon and Relay for Life! We are proud to say we raised over $15,000 for philanthropic initiatives last year. We participate in annual fundraisers to raise money for the Sigma Kappa Foundation. This past April we hosted our second “Tacos and Chacos” and raised over $3,000 for the Foundation. We have adopted a local street next to campus that we clean up 4-5 times a semester. We also work with Lily Patch Farms and participate in an annual farm clean up with Phi Kappa Tau Fraternity every spring semester. We work closely with Appalachian Brian Estates and host an annual senior prom towards the end of the spring semester.,Other events we have hosted for Brian Estates have been a puppy play date, a Thanksgiving feast and a Valentine’s Day dance. Each year we spend some time making blankets for the Maine Sea Coast Mission. Around the holidays, we also collect gift cards and cans to send up to Maine every year. We host an annual Elephant Gala every fall during Parent's Weekend to raise funds for Alzheimer’s to assist caregivers, research and those who have been diagnosed with Alzheimer's. Money is raised through ticket sales, donations and a silent auction. We also participate in our local Walk to End Alzheimer’s and to support those affected by the 6th leading cause of death in our nation.